Digging-in wasn't quite enough. The Foxes went down to ten men with over an hour left to play and, from that position, it was incredible that they were even on level terms at the break - let alone with two minutes left. Hull City were the better side, using their eleven men to good advantage to pen-back Leicester into their own half and slowly tire the Foxes' midfield and create the chance they needed to put their noses ahead. Eleven vs eleven would have seen this finish very differently. Leicester were unable to mount a meaningful attack once Matt Mills received his marching orders, unable to commit men forward as they worked tirelessly to keep the Tigers at bay. It was a heroic performance to get level and keep the scores equal until just two minutes remained in normal time. Only a touch of class from Robert Coren could give Hull the lead. Pearson's Foxes may now have been defeated but they have gone down fighting and can hold their heads high. The lungs on this boy! Konchesky was equal to Hull's second half onslaught, the ex-Liverpool full-back putting in an awesome shift to help his team avoid an embarrassing defeat. His goal, against the odds with Leicester down to ten men, ensured the Foxes had something to play for into the second half. 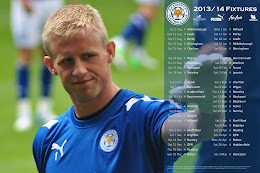 Yet another world class save from Kasper Schmeichel after the hour kept the Foxes in it. The young Dane remains the Foxes' most important player. Coren's rocket right boot was the difference between the two sides and there was nothing Schmeichel could have done to stop what was an absolute thunderbolt. Removed with 22 minutes remaining on the clock after a valiant effort alone up front, David Nugent again put in a very important shift. Unfortunately he could not give Leicester an unlikely point. Absent in the Leicester midfield, Neil Danns failed to repay the faith shown in him by Pearson after his promotion to the starting eleven. There is no doubt Danns has quality and ability at this level - he remained as the only stand-out player in Crystal Palace's dire last season - but for the Foxes, Danns has thus far failed to ignite the midfield. He must put in a greater shift to cement his place in Leicester City folklore. Sent off rightly, Matt Mills can have no argument against his red card. It was a careless challenge to make as last man and, ultimately, the Foxes' tiredness when down to ten men and ground down by the Tigers offensive play allowed Hull the opportunity - that Coren took beautifully - to claim all three points. Big Sol Bamba's insistence on bringing the ball forward and trying to create an attacking movement was rather the wrong thing to do considering the Foxes' tiredness and need to hang on to claim a point. anything entirely, however this paragraph offers fastidious understanding yet.